Ready to go Paperless? Try My Efact Paperless Office for 15 days with NO obiligation! Welcome to My Efact Paperless Office, My Efact is a paperless office system that gives you scanning, secure email, archiving, and all the other features of a powerful online document management system. Going paperless will save you time and money. Law offices, insurance agencies, and small and large businesses are all migrating towards paperless office solutions; can you afford to pay employees to dig through filing cabinets trying to find paper files? 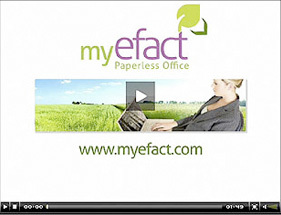 To learn more about creating a paperless office with My Efact Paperless Office, view our short video above and check out our paperless office blog page. Sign up for a FREE Test Drive of My Efact Paperless Office! Ready to go Paperless? Try My Efact Paperless Office for 15 days with NO obligation! Now you can sign up 24/7 for your FREE Test Drive! "Our office has been using EFACT for several months now and it has been without a doubt the best technology upgrade we have made in several years. The online interface is extremely user friendly and it has allowed our office to save time and money." Connecting a scanner to your PC: USB or SCSI?